A day for relaxing after the activities of the weekend. The wonders of this place are often beyond words. Even though we are not working, we still marvel at the beauty of the lighthouse. One of the problems with being up there so much is you simply become accustomed to the sight and no longer really see it. It is through the expressions and exclamations of our visitors that we now experience the light. Today we decided to experience our surroundings through the medium of our feet. We are going to walk over, maybe down is a better word, to Lake Marie and do a little bit of exploring. 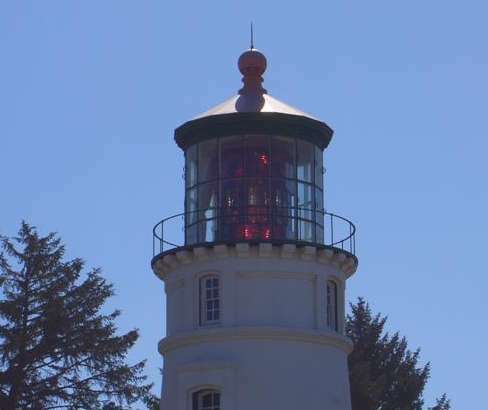 Umpqua Lighthouse State Park is right next to the lighthouse property, though the lighthouse itself is not part of the park. Believe me, it causes great confusion on the part of our visitors, who think we are part of the Park and therefore should give them a discount because of the cards and passes they carry. Our policy makes it very simple. No discounts, period. We walked down the hill, after all, don't lighthouses always sit on a hill, and found the trail around the lake. I had bundled up like we were going on an expedition to Antarctica. Linda on the other thought we were going to Palm Beach. Turned out neither of us had guessed correctly. The trail winds around the lake, but instead of being near the bank out in the sun, it is set back into the trees, in the shade. Linda discovered she was, perhaps, too lightly dressed, while found myself a tad over dressed. The exertion from walking soon warmed Linda a little and over cooked me slightly. Some days you just can't win. The amount of clothing adjusted we tried once again, this time throughly enjoy our meander through the woods. Eventually we came to the inevitable fork in the road. As could be predicted, given free choice, we picked what turned out to be the trail that led to a dead end. It was Linda who balked at what we saw. Now that Appalachian farm girl ain't afraid o' nuthin' as she used to say, however all her experience was with rocky hills not great big piles of sand. Just like a stubborn jacka$$, she was not going to go one step further, so we turned around and headed back to the fork in the road. Having picked the right fork last, we took the right one this time also, or putting it another way one that was left. Not the one to the left, because that would have taken us back the way we had come the first time. No wonder women have no sense of direction. With descriptions like this I would be just as mixed up, lol. Irregardless it was a beautiful place to be. The walk was not all hard work and wandering down the wrong trail, however. Once we had finally taken the right trail, the one had been left, we began to see a marked change in the vegetation. 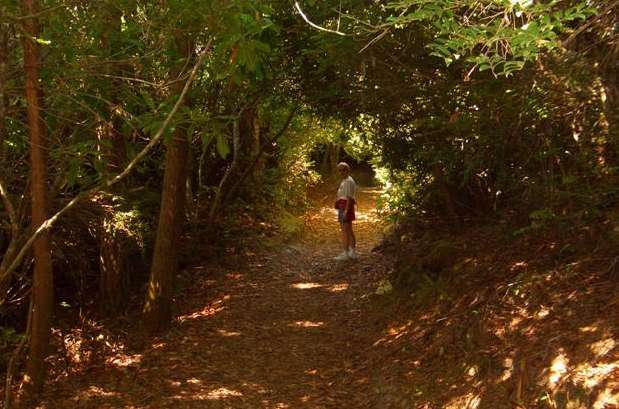 Deep forest and Spanish moss gave way to open areas and sunny spots. It wasn't long till the hill girl was at home once again. As you can see it didn't take her long to find blackberries and huckleberries to re-energize her waning reserves. 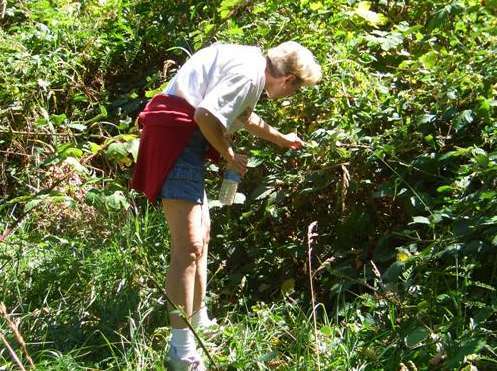 Notice how carefully she is examining this plant to make sure she only gets the very best berries. She was into quality, I was into quantity, we both ended up happy. 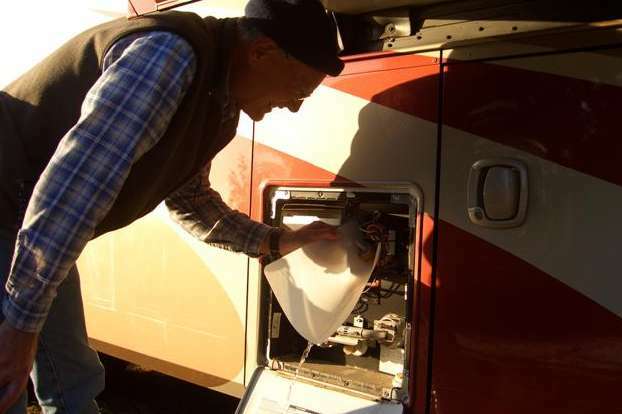 Back at the coach we did a few maintenance tasks, including recharging the air in the hot water heater. The water seems to drip incessantly from the water heater compartment. If this doesn't fix it we will put it down on our list for when we visit the Monaco Factory Service Center after Thanksgiving. 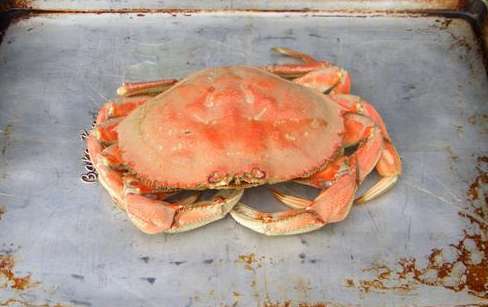 Today is C-day, or crab day. 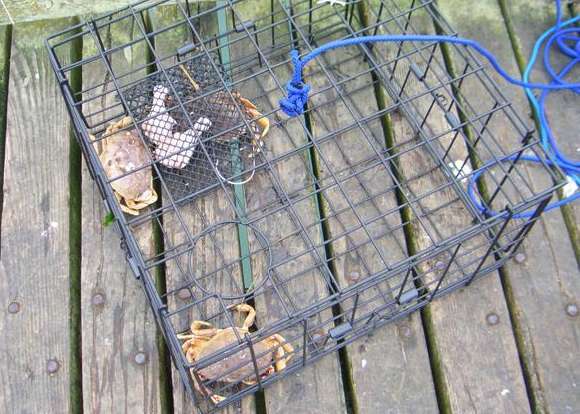 We hope to be more than a one trick pony, but for now we are just a couple of one trap, crabbers. After a breakfast of scrambled eggs, Canadian Bacon and cantaloupe pieces we put our trap and chicken drumsticks in the Explorer and headed off on our great adventure. Arriving at the dock we saw the fog had settled in, enveloping the pier in its soft hazy grasp. 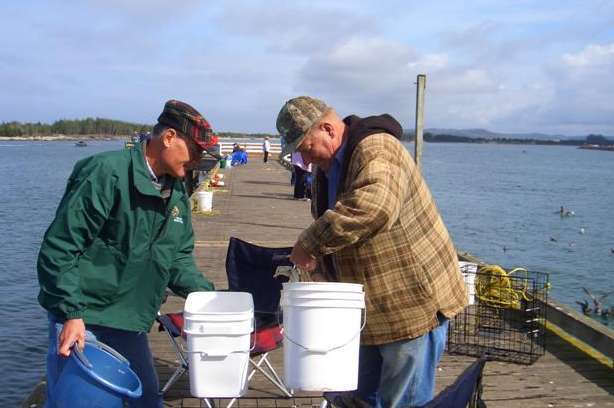 But with the large number of crabbers on the pier, we were encouraged. Having already decided that no matter how long it took, we would not leave until we had a least one crab, we were eager to get started. Out on the dock, the "newbie" crabbers started getting ready for their first attempt at putting food on the table. As you can see from the wrapper still on the line that would be used to pull the trap, we were as green as green can be, lol. Next it was baiting up the trap. Don't those chicken legs look like just the thing a hungry crab would want, lol. 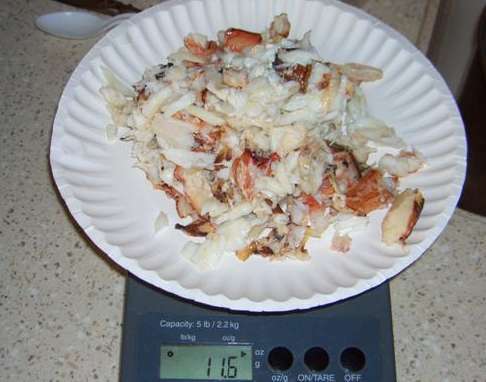 The only problem is that the crabs have to be a minimum size and they also must be males. Eventually we caught one that met these requirements, but try as we might, we could not catch anymore. Finally calling it quits, our goal of catching a crab having been met, we headed back up to the coach. Now it was show time. The first problem was how to cook it. Linda's late August spy activities not withstanding, we were playing it pretty much by ear. Sure we had looked at websites and watched people, but we had never actually seen it done. There were two ways they talked about cooking Dungeness crab. Cook, clean and pick, or clean, cook and pick. For our first attempt we decided the cook, clean and pick method was best. Soon the water was boiling away, well maybe it wasn't quite that simple. The weather was changing, the wind had come up and consequently our newly purchased little electric hot plate was overwhelmed. We solved it by used some of the discarded highway signs stored near our site, the advantage of volunteering for a government agency, lol. Between the signs and the lawn chairs, we erected an impromptu windbreak. 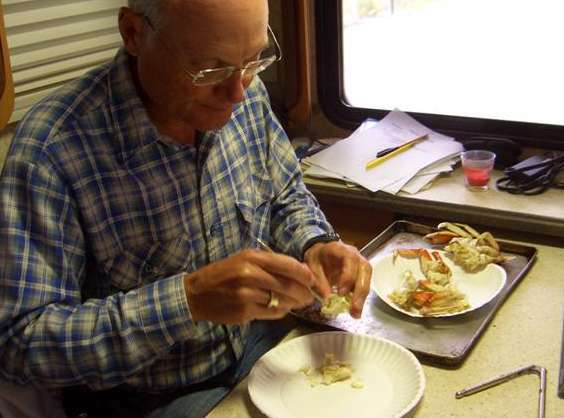 The desire for fresh crab was overcoming all obstacles. 30 minutes later he was out of the pot and cooling prior to being cleaned. Linda thought he looked cute while I thought he looked sad, but we both agreed he definitely looked like dinner. Next he was cleaned, but due the graphic nature of the task no photo's will be shown, lol. Then came the last part, picking the meat. A job I was most eager to do and no it was not one for plate, one for the mouth, one for the plate, one for the mouth as we needed all the crab we could pick to make crab cakes. The transformation of the resulting pile of crab meat into a meal was Linda's part, and did she do great job of making crab cakes or what? As you can see, we ate well tonight. How many thousands of times have other people done the same thing we did today. To know the link with the past. To experience the connection of being human. The joy of life. The spirit of individuality. The adventure goes on and on. Not a good day for one simple reason. As I was cleaning my glasses this morning the frame broke. The left temple piece just fell off into my hand as it broke in two right at the point it attached to the lens. This is a good news, bad news situation. The bad news is my frames broke the good news is I will be getting new frames. There has been something not quite right for some time, where my eyes bothered me in the evening. Linda claimed my glasses were cockeyed on my head. That would mean I have a mis-shaped head. I don't think so, smile. Now, maybe new frames will solve the problem. If that's not putting a positive spin on the situation I don't know what is. Maybe I should look for a job as a politician's press spokesperson or public relations officer, lol. Still, it soon became time to head off to work, so we begin the long 15 second walk over to the museum. The way our life unfolds is why I have to constantly shake my head to make sure it is real. Talk about living a life of dreams. Soon the signs are hung and the visitors start arriving. Tour after tour takes place. A sip of water here, a handful of grapes there. Eventually time is taken to eat a turkey wrap. I am surprised to see Linda's wrap is still in the refrigerator. Obviously I am not the only one who has been busy, smile. It is a nice day with many visitors and most tours have 8 or more people. The compliments roll in, so do some donations. We are having a good day. The last tour of the day is only three people and we leave shortly before 4 o'clock. When 4:00 arrives, Linda closes up the museum and walks up to the light house. She is finally going to be able to go on one of my tours. 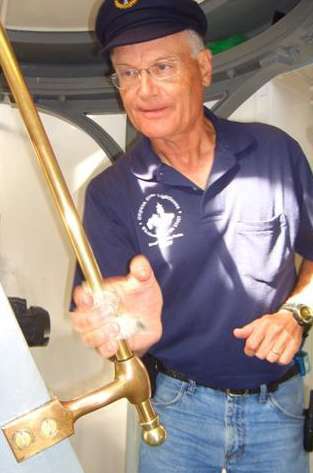 Not only that, but she gets to take a couple of photo's, Notice look of concentration on the tour guides face as he grasps the 116 year old brass rail that leads up into the light. Photo's cannot do justice to the lens, but I think Linda took a good one. As we bid adieu to the day, the sun set below the ocean. A little later the reflections of sunlight from beyond the western horizon made for a cloud show that was beyond spectacular. I hope that something spectacular happen in your life today. Some mornings it just doesn't pay to get up. Not that this was one of those mornings, but..... It was just starting to get light when I first opened my eyes. That was when the mental gymnastics began. My resolve of last evening to head off to the crab pier was about as murky as the gray sky. After a few moments, the basic instincts inherited from Cro-Magnon man took over and I was getting up to prepare to go in search of food, smile. 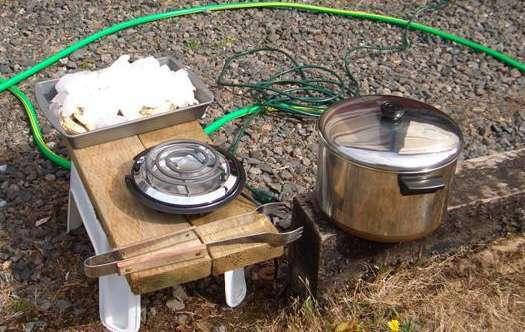 Gather up my implements, i.e., one crab trap, two chicken drumsticks and the bag of beef fat, the two buckets, gloves and a book to read, off I set on my food gathering expedition. While it is a short drive to the pier, it is a long walk out to where the big ones lurk. At least it is a long ways out to where the other early rising crabbers where placing their traps. Besides all the gear previously mentioned, I also was carrying a chair. My research on the lighthouse and the associated life saving station had uncovered the fact, the pier was 1/8 mile long. 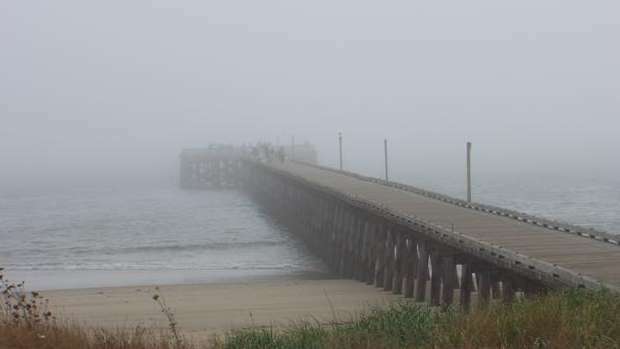 As I lugged my paraphernalia through the sand to the end of the dock, morning fog and haze caused the far end of the pier to fade in and out of view. Suddenly my mind was no longer recognized the modifier, 1/8, it was only focusing on the word mile, and even then trying to modify it to miles, lol. What is there about carrying a load for a distance that makes to get heavier with every step. I must have slept through that part of my physics class. Eventually I did arrive at what I determined to be the ideal spot. It is actually rather easy to do. Just walk until you have to put everything you are carrying down while you rest, look around, think about how heavy it is going to be if you pick it back up and walk further. Look down, see water, don't see bottom and you've found your spot. Figured I'd done pretty good because where I was, there were people on both sides of me, so I proceeded to get set up. 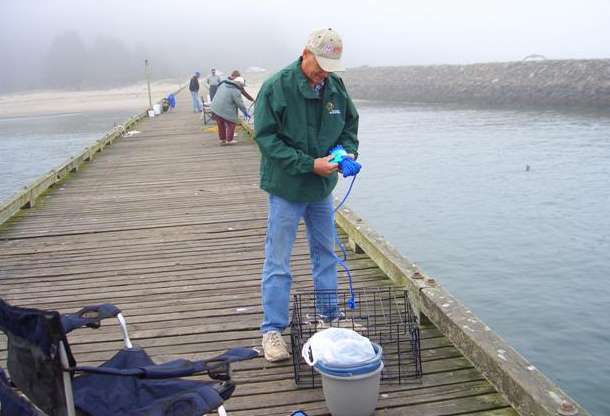 Since this was my second time crabbing, I was practically an old timer. Consequently I set about my task with the confidence only youth, or in my case, lack of experience can inspire. No sooner had I set everything down on the dock, than complications arose. The fellow next to me on the landward side, see how quickly I've picked up this nautical jargon, asked if I wanted a shad head. Now over the course of my six decades of life I've been asked a lot of things, but I'll be the first to admit, that never before had my ears heard this question. Not quite sure of how to react, I looked over at him, and was greeting with the sight of fellow who had obviously been crabbing more than 2 times in his life. 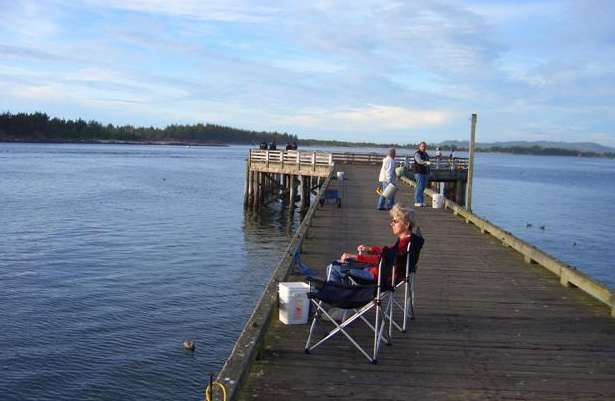 He smiled and said he going to try his hand at salmon fishing from the nearby jetty and didn't need the shad heads he had left. I thought, what the heck, and told sure I would. Not wanting to appear stupid, I simply took the plastic bag and set it down. Unfortunately I was soon to find out that by trying not to look stupid, I was looking stupid. After making sure his traps were secure, mentioned I might want to put the shad in my bucket so the sea gulls wouldn't steal them and walked away. Looking over at the bag I could see a couple of gulls moving ever closer as the cautiously walk on the edge of the pier. Quickly I removed the temptation from them and put another mark of experience on my crabbing board. The next few hours brought nothing but small ones in my trap. I finally decided the giver of shad heads was far smarter than I was when he decided to go salmon fishing. Then concluding that today was just not my day I packed up and headed back to the coach for a dose of the real world, another day on duty at the lighthouse. Breakfast was scrambled eggs, Canadian Bacon and cantaloupe pieces. Then comes non-stop action. All day long it was one tour immediately after another. As always it is a large swath of humanity. It always amazes me how there never appears to be anyone who is bored with everything on the tours. There is always something that pikes their interest. It way be the life saving boat or the maintenance building architecture. For others, the original, long gone lighthouse, the oysters or the whales. Some focus solely on the lighthouse, the difficulties of construction, the stories of the keepers or the beauty of the lens. But whatever they come for, I'd like to think that everybody goes away better off for having visited our little corner of the world. How about you? Did you expose yourself to something new today? Life and growth. Impossible to separate. Not to grow is to waste away, to die a little bit at a time. I'm glad I could live today. Up early so we can head down to Coos Bay and Bay Optical Labs. This lopsided looking at the world is getting to me. A quick breakfast of shredded wheat, our normal in a hurry travel meal, and we are off. It is definitely not one of those mornings they put in the travel brochures. Cold and with a misting rain, we don't stop to look at any possible berry picking spots, but rather move out right smartly, as the saying goes, toward Coos Bay. 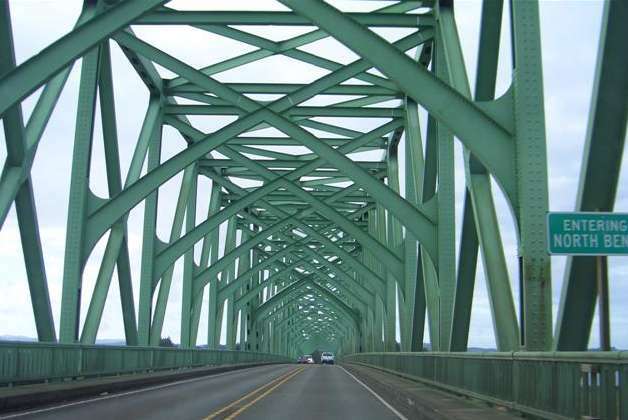 Our actual destination is in North Bend, which is just like it sounds, north of Coos Bay. We have no trouble finding the address due to the unerring accuracy and directions we receive from our GPS. Linda really does a good job programming it. After all, isn't that what navigators do, smile. She even had backup maps made just in case I, with my altered eyesight, managed to lead us astray. 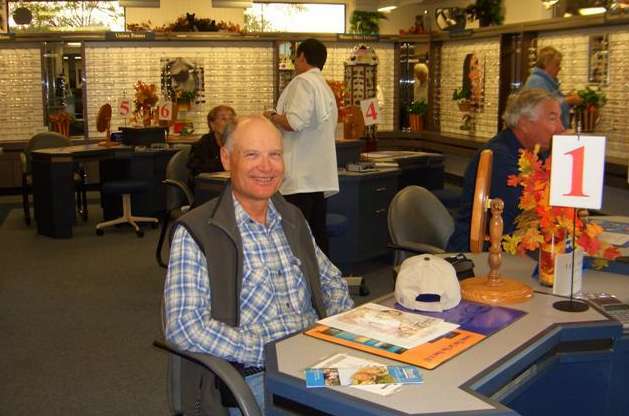 Soon I was being informed that, yes, they can do repairs and please wait while they see if my frames can be fixed. Shortly after we got the bad news. Because of where the frame had broken there wasn't enough of a piece left to be able to solder it, so they would have to be replaced. We set about picking out a replacement frame and though the didn't carry the Silhouette brand that I was wearing, they did have a style I liked. It was going to take about 45 minutes to mount my lenses in the new frame, so we drove over to Bi-Mart and bought a few things, returning to more bad news. This was bad news for both me and them. Me, because one of the lenses had cracked when they were removing the old frame. Them because the said they would replace the lens at no cost. Now I'm getting a new pair of glasses for the cost the cost of the frames, but I decide to make one switch and go back to the full rim style. Ninety minutes later I was all outfitted as good as new and except for the extra weight and the cost of a new pair of slip on sunglass, was as good as new. Even got the senior citizen discount, plus I love the no sales tax savings. Thinking back on it, we noticed quite a few cars in their lot with California plates on them. Wonder if some of those people were avoiding the high California sales tax rate. As you can see from the photo, I was obviously their number 1 customer, lol. The eyesight of the old man restored, we headed to Walmart to get groceries. Having spent our months worth of impulse purchase money to get my glasses fixed, we restrained ourselves and managed to only buy what was on the list. The fact that were a few goodies on the list made the task easier, smile. We headed back across the bridge and tried to find a wayside to eat lunch. We didn't succeed, but still found a pleasant spot to stop. 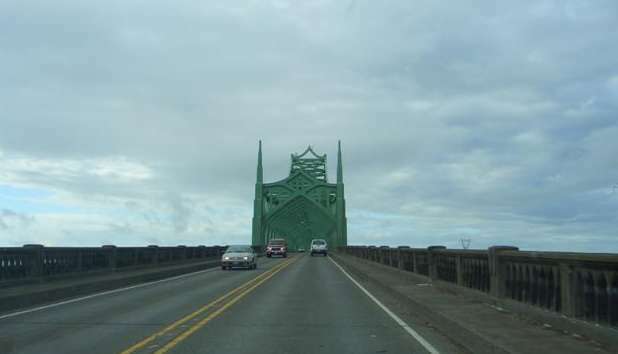 One of the true marvels of the Roosevelt Highway, US 101 along the Oregon coast, are the Conde B McCullough designed bridges which have to be seen to be appreciated. Heading into North Bend this morning Linda took a few close up photo's that give a sense of their beauty. This what you see as you drive up the concrete approach section looking south. The beauty unfolds as drive through the structural steel section. Back at the coach I spent the rest of the day trying to get used to my new lenses and frames. It was a day well spent and one that will make my future brighter, smile. Early morning finds me down on the crab pier. It also finds me repeating my luck, or more accurately, lack of luck has has become my hallmark. It was enjoyable however, as the fellows who I have talked to before were their once again. Falling in the small world category, it turned out that before he retired, one of the fellows used to buy construction materials from the same company I worked for. Of course the fact I was wearing my old company windbreaker with their logo on it might have also played a part. As we chatted and pulled traps it some became apparent that no one was catching anything today. Oh well, at least it just wasn't me. Before long I saw a familiar female figure walking out the pier. Breakfast had arrived. Well, actually it was Linda bringing my breakfast of Uncle Sam's cereal, blackberries and yogurt, which I ate wish real relish, much to the delight of the fellows I had been talking to. Linda's presence did not bring any better luck to our endeavors, though I did net a small one shortly after she came. One one else was having any better luck and one by one the people began to leave the pier, empty buckets in hand. Finally we had had enough of this also and brought in the traps, preparing to leave. This was when our luck changed and we got two good sized crabs. Notice the operative word, got, rather than caught. Turned out the fellow I had gotten to know had been out a lot earlier than I had. He asked if we wanted a couple of crabs. Before I could answer, Linda said, sure we would. He smiled at her and, with a twinkle in his eye, allowed as to how he'd been out real early this morning and had caught a couple but wasn't in the mood to boil them. Thus we ended up with two crabs. Guess you could say we talked those crabs into our bucket, lol. Cooled, we picked the meat out and were rewarded with the fruits of our labors or maybe it should be the succulent morsels from our endeavors, lol. We headed back into the past for our lunch. Back before there were turkey wraps it was not a time of darkness, it was a time of variety and one of those various lunches was our Portabella mushroom pizza. 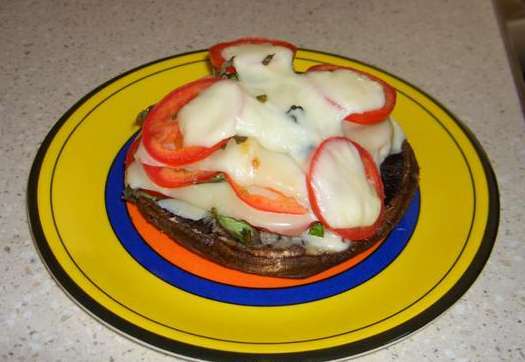 A large portabella rubbed in olive oil and garlic and piled high with alternating layers of tomato, mozzarella cheese and fresh basil leaves. then baked till it just begins to melt. Food not for the mass, but rather for the majesties, and certainly not your normal no crust pizza. That's what we like about eating the South Beach way. 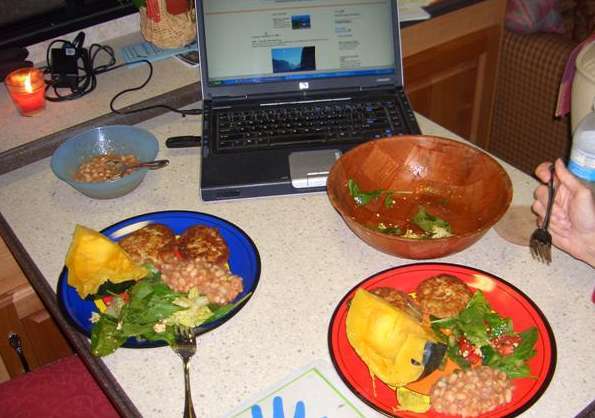 Good healthy, tasty food. Speaking of food, dinner was crab. Crab cakes made a new way, one that is mostly crab. The good part is she now has two different delicious recipes for making crab cakes. One that has a lot of filler for when we don't have much crab and one that it almost all crab for when we have lots. Lets hope we have the latter more often than the former, lol. A quite relaxing evening, a dish of ice cream and the end to another wonderful on planet earth. This is a truly beautiful day. The sun is shining, the birds are singing and we have yet another day off. After a late breakfast of oatmeal and fresh blackberries, we headed off to Reedsport. Having really enjoyed the service at the Reedsport Church of God last Sunday, we decided to go back again this morning. The lead singer in last Sundays service recognized us as we walked in the back of the church, welcoming us back. We had a great time talking about the service and the fact that it was the music as much as anything that brought us back. She related how it had been difficult at first incorporating praise music into the services as many of the older members wanted to sing the traditional hymns rather than the new music. It took them a while to find the right balance. It really made a difference when they decided to sing only the most well known and beloved of the traditional hymns. The service this week was just as uplifting as last Sundays and we were glad we went. After church we decided to go crabbing. However instead of the crab pier, we would try our luck at the crab dock. 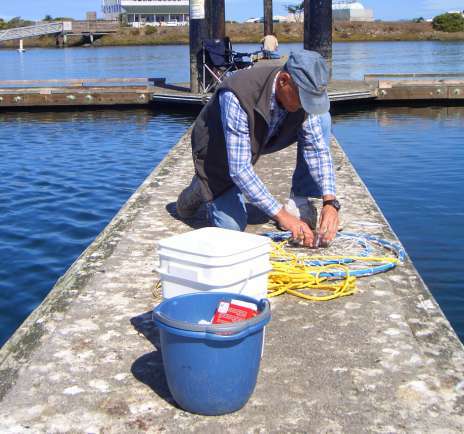 The more we go crabbing, the more I come to the conclusion that it is us and not the location that is the heart of the problem. I will say one thing for our efforts, it was about as nice a day as one could ever wish for. The sun was out, the water was smooth, the sky was blue and the winds were calm. Two people, two lawn chairs, two books, two crab traps and two chicken drumsticks. It all added up to a great afternoon in the sun reading and catching some little crabs. They were cute little things, but they sure weren't keepers. In fact several of them together wouldn't add up to a keeper, lol. Dejected at our bad luck, but excited because Linda got to talk to the kids while I was fruitlessly manning the traps, we headed back to the coach. After dinner, one with none of the crab we had expected to catch, we decided to try our hand once again, this time at the crab pier. When we arrived there were only a few people there. Little did we know what the next few hours would bring. Since we were getting good at going crabbing, we soon had our chairs set up and found ourselves relaxing while awaiting a keeper to wander into our traps. As it got closer to dark more and more people continued to arrive. 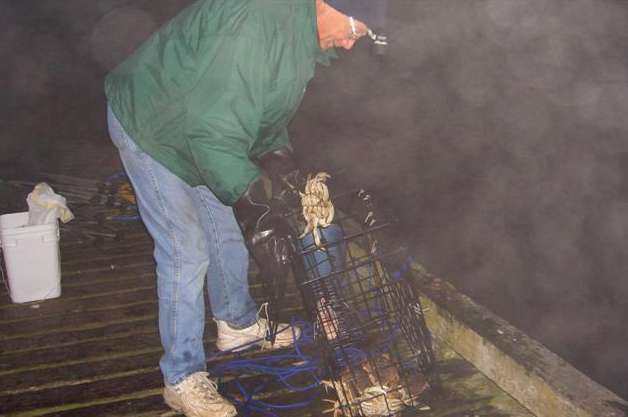 There had been a number of traps across the pier from us, but the people had moved them out onto the end of the dock. Not long afterward a family came out and set up in the same place. Before we knew it the sun had set and that was when the action began. We started noticing the family across from us pulling their traps and getting several keepers. 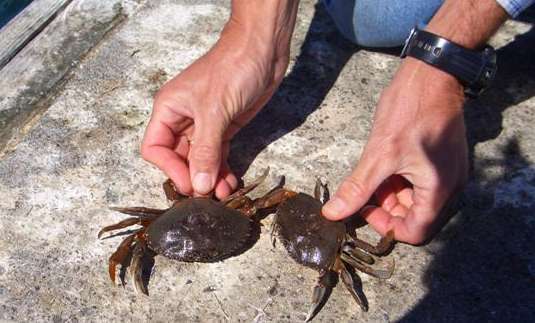 We pulled ours with several smaller crabs. Fast forward about a half hour. We pulled our trap and there were a lot of crabs in it. 10 by my count, 11 by Linda's, but not a keeper in the entire lot. This same scene repeated itself several times over the next hour. Everyone around us was getting a keeper or two on every pull, while we got little ones. Our neighbor finally asked us if we had any more bait. Turns out that the little itty bitty drumsticks we were using were attracting little itty bitty crabs, while monstrous meal he was offering them was much more likely to attract the big ones. As we walked back to the Explore we vowed to have huge pieces of chicken in our future, smile. The only solace we had was we knew there was dessert waiting back at the coach. A day that didn't go the way we wanted, but one that may make our future days brighter. 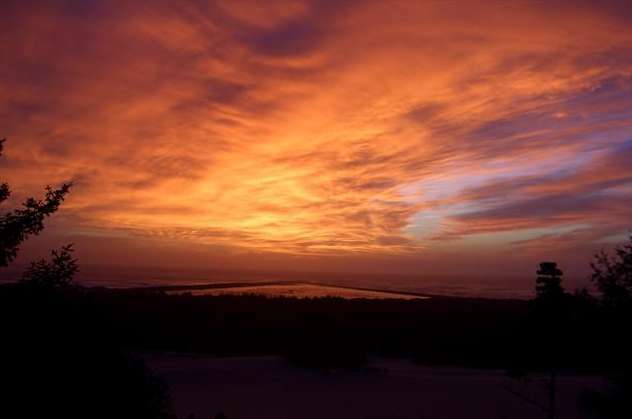 This is a wonderful time of the year to be in the Winchester Bay area of the Oregon coast. We made a good decision to volunteer here. How often do we get a gut feeling about something and ignore it. This one case where we didn't and the results have proven to be beyond our wildest dreams. We've already decided to re-up for the same months next year. Everyone wants to work the summer months, but as we've talked to people it has become apparent that fall is actually the best time of the year to be here. That is, unless they have an usual fall season where rain becomes the norm. Guess that would mean we shouldn't have listened to our gut feeling. But then hind sight is always 20 20, lol. Heavy duty computer work on both of our parts today. You'd think we were just killing time until evening when we can go crabbing. Guess what, you'd be right. We did go shopping, making sure to get large chicken legs with thigh attached instead of those minuscule things we were using yesterday. Oatmeal for breakfast, wraps for lunch and leftover meatloaf for dinner, then at last it was getting dark. All of the previous hours have been aimed at this time of day. Off we go to the crab pier. We stop at our accustomed location, the same spot we were catching lots of little ones last night, but also where the other people around us were catching all the big ones. Load the bait box, then throw, wait 15 minutes and retrieve. 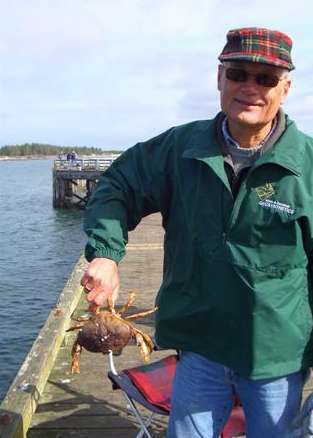 By the time we were ready to call it quits we had one good sized and two very large crabs. Not as good as those around us, but by far the best we had ever done. Plus we only had the two traps while most everyone else had more. 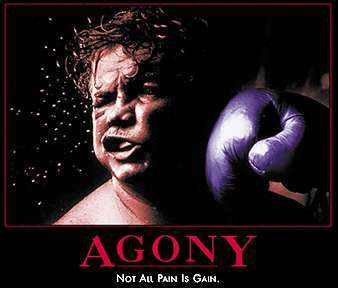 Awoke thinking about having to go back to work tomorrow. What a difference from my past life. Now it's not a time of stress, but rather a time of pleasure. Since I've picked up some background information on lighthouse design over the past week through additional reading, I can add new information to the tours. Excited about work, something that will make work fun, I don't believe how much are life has changed at times. Since we had no real plans for the day we ended up doing a whole lot of nothing, which, I've learned, there is nothing wrong with doing. Well, we did eat pretty good. But mostly I struggled sitting at the computer trying to give birth to the new website. Linda was humming along doing Ebay things. She really enjoys Ebaying, plus it does bring in a little extra fun money. She was really surprised when one book she thought would sell for about $5.00 ended up selling for $87.00. Of course the other side is items she thought would bring in $10, didn't even get a bid. The key is to have two people who really want an item, start bidding against each other, something she has no control over. Plus the timing of when an item goes up to bid is also important. If you list an item early in the morning, that's when the bid will end. Not the ideal time to encourage last minute bidding activity. But is so neat to hear the yell of glee or the moan of despair when checks on her items. Kind of like the Linda version of the ecstasy and the agony, lol. 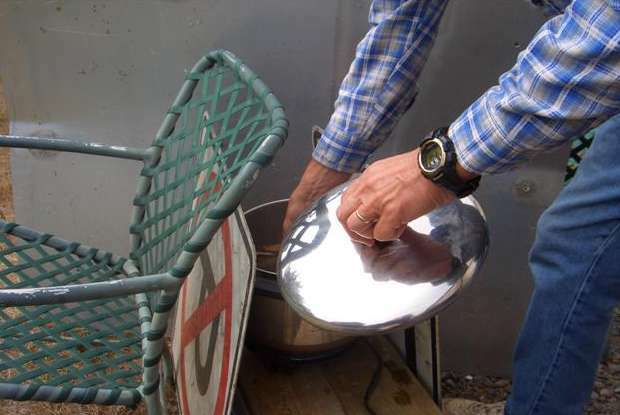 But not all was bad today because in the afternoon we picked the crab we had caught and boiled last night. I said it was pound, Linda said it was little less, there was 15.5 ounces to be exact, so you figure whose statement was more accurate, smile. The crab, or at least part of it, became supper. A crab bisque made with fat free half and half, I know fat free half and half sounds like an oxy-moron, but it really is okay. The bisque was awesome tasting and those words are Linda's. Now for the rest of the story as Paul Harvey says. This was the first crab bisque Linda had even eaten, let alone fixed. "Fishy" soup, of even the merest thought of any type of seafood soup was something that her mind and stomach had always rebelled against. Talk about someone changing their mind. Not only that, but we're going crabbing again tonight, because she wants some more, lol. Unfortunately the gods of the sea did smile upon our endeavors tonight and though our trap and net repeatedly brought up a number of crabs they were always to small or if they were large enough to keep, only females. Looking around we were not the only ones coming up empty. Maybe there is something to that slack tide thing. Unlike last night we did get a few photo's and you can also get an idea of how foggy it was. 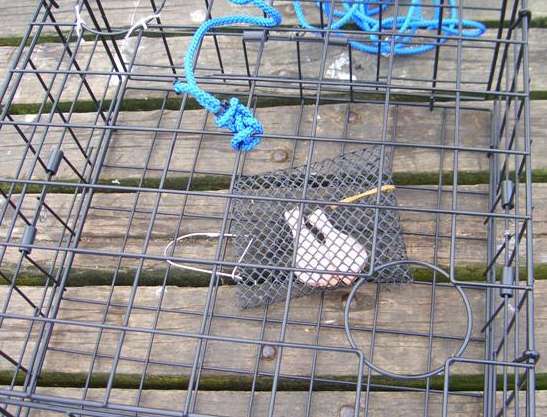 The crab in my hand is a female and you can see the small ones in the bottom of the trap. After a very slow drive back to the coach through the fog, followed by dessert, as always, we called it a very good day even if we didn't catch supper for tomorrow night. Of course with the left over bisque and the crab meat we didn't use there is still going to be crab for supper tomorrow night, smile. Hope you had just as great of a day as we did. Sept 20 If you are reading this you know our new website is up and running. It has been a real struggle, but at last I have gotten it done. We are really loving our time at Umpqua River Lighthouse. After last nights disappointment on the Crab dock and early return to the coach, I thought I would be up early this morning. That was not the case. It was about 6:15 when I finally got up, but then I took like a duck to water, or at least like a man on a mission, working on the new website. Linda treated us good making oatmeal with peaches for breakfast and then almost before we knew it it was time to walk over the the museum and open up for the day. Gaylyn was spending the day in Coos Bay so we were going to be on our own. It was really foggy, so the odds were that it would be a late arriving crowd. It also gave me some time to work on the lighthouse door. Turned out I wasn't he only tour guide having trouble with it as the note from Gaylyn outlined. Hunting around in the cupboards of the kitchen I couldn't find the blue tape we had used to repair the signs the other day, but a call to Linda, which put the super snoop to work soon resulted in the tape being placed in my hands. The door now looks a little odd, I'll have to take a picture tomorrow, but there were no problems getting locked in the lighthouse like happened the other day, smile. It took about 30 minutes for the first guests to walk through the door and the day to begin. It always amazes me how Linda can be so bubbly and enthusiastic from the git go. It take me a while on the first day back after our time off to get into the swing of things. I always feel I've let the people down who take the first tour of the day. The fact that I get praise and comments about what a great tour it was don't seem to assuage my melancholy feelings. By the second tour the adrenalin was flowing and I was in my better form. It was also a big help that the fog had lifted. It makes it tough when the fog is in and you can not see either the river or the ocean. It takes a leap of imagination on the part of the people on the tour to understand the facts about the reason the lighthouse being positioned at this location and also what the heck we are talking about in reference to the original lighthouse. Such is life. It always seems like the day just flieby. Give a tour, hurry back, take a few swallows of water, give a tour. Sometime around one o'clock grab a bite to eat and give more tours. Linda has the same problem if it were. I operate on the thanks I get from the people taking the tours and the donations they put in the box at the lighthouse. 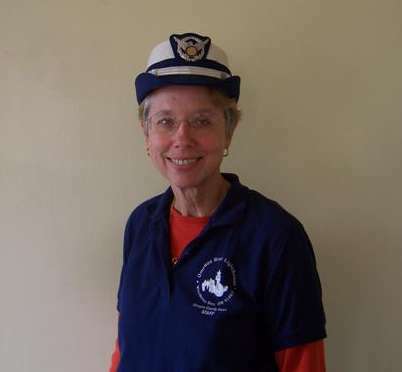 Linda has the donations at the museum and also the lighthouse commerative coins she sells. She sold two today. Between the two of us we brought in $28 in donations, not the best day, but not bad either. 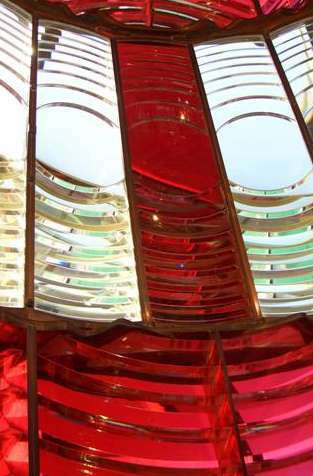 We had a few people today who were really into lighthouses, so even though the number of visitors was low, the donation to visitor ratio was good. I think we just worked too many years where we were performing against goals to stop now. Besides the real beneficiary is the lighthouse. Mid day Linda had a nice surprise. A gentleman came by to donate some Coast Guard items he had acquired. There was a uniform from the mid 40's, plus some coast guard auxiliary items. Notice them on the attractive young model in the photo.below. The last tour of the day left just before 4 o'clock, so we didn't finish until after 5. Something to do with a wordy tour guide according to other half of our team, lol. The nice part about the tour was that there were several people on it who were very knowledgeable about lighthouses. Not bragging, but when you are told by these people that you really know your stuff and that it was the best tour they had ever taken, it can more than make up for working an extra hour. Just as with our past jobs, it is the self satisfaction, not the pay that drives us to do a job above and beyond what is expected of us. While I was occupied with the tour Linda balanced the days books and had the money all counted. Having me call down the money I took in up at the lighthouse, lets her have everything ready to close up when I return. That is one smart woman. 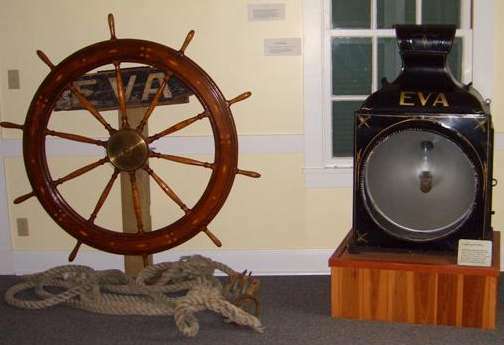 Since she had a little time before I got down to the museum, she took a photo of the bow light and wheel that was on one of the stern wheelers to ply the Umpqua. The museum is full of the odds and ends of the history of the area. We may try to post more photo's of some of the interesting items in the museum. Dinner was crab cakes and crab bisque. The rewards of those late nights on the crab pier, lol. Then came more work on this new web page. It was hard to finish the journal, but then came the hard part, uploading it to the server and getting it to run. This is not something I do very often to say the least, so it was frustrating, which is putting it mildly. Of course the chocolate zucchini brownie and fat free, sugar free double chocolate ice cream certainly helped, smile. Never did get it running, but there is always tomorrow. I take solace in the fact it has to be some little thing that I'm doing wrong. Now if I could just figure out what it is.